Forgive my cozy style today. I wore this outfit traveling home yesterday from Charleston because I've learned an important lesson. Traveling while pregnant is tough. Between the frequent bathroom breaks and being uncomfortable I decided I'm not traveling more than a couple hours in the car again until Maddox is born! I attempted to be as comfortable as possible without being frumpy in sweats and a t-shirt. This means my uggs were a must as well as my favorite maternity top by Liz Lange. Jana is glowing! I love it when she wears coral; it's her color! And how stunning is our co-host this week, Claire in her robin's egg blue heels? Love! Check out both of their looks on their blogs. Next week we are going in the complete opposite direction and showcasing the beauty of black and white in our wardrobe. Join us! Please remember that this linkup has a very specific purpose! If you are linking up random posts that don’t fit with or address the prompt for the week in some way, you aren’t in line with that purpose and your link will be deleted. 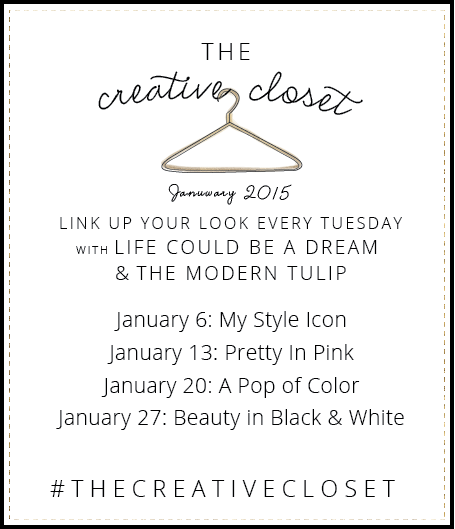 21 comments on "The Creative Closet || A Pop of Color"
You look fab! Blue is one of my go-tos to add some color to an otherwise bland look. Thanks for letting me co-host with you two this week! Look at that bump! Love it!! And that cardigan is perfect! It looks so comfy and cozy and still super chic! Love this vibrant blue! You look so cozy but cute. I love that pretty bright scarf! Traveling can be exhausting, but I know it's even MORE tiring when you're pregnant. I don't blame you for not wanting to do much more of it before your kiddo gets here! I love this comfortable look! I think you look great! Those boots look so cozy, and I love your bright scarf! Ah, you look so cozy! I want comfy clothes right now! That color scarf is amazing - it looks great on you! Glad you made it through your trip! I am not going to lie, I'm a little but obsessed with those jeans!! You look amazing, girlfriend!! Love the patter combo! That scarf is great on you! Loving how cozy and chic this look is! Those sunglasses are perfect. The perfect pop of one gorgeous shade of blue for sure! 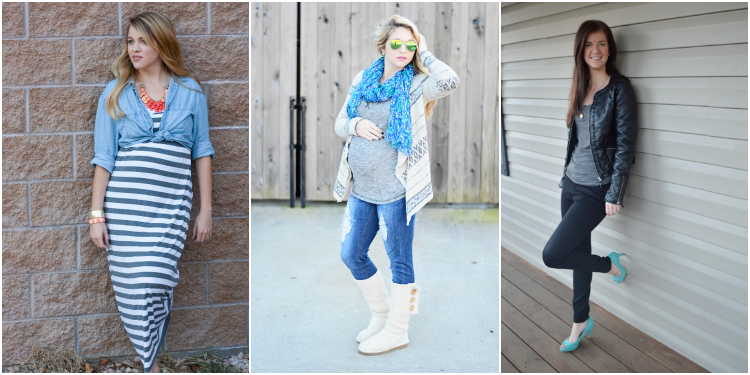 I have been on the lookout for comfy maternity tees and now feel like I need to RUN to target! Those glasses alone make for a great pop of colour, they look awesome! I love cardigans like that - they have the perfect amount of drape to look flattering but also are so comfy and cozy. I'm glad you made it though the car ride okay! I'm with you...traveling while pregnant = comfy clothes! I'm flying in two weeks and am already contemplating my outfit. 6 hours on a plane during the 3rd trimester won't be fun, but your outfit is giving me inspiration as to what I might be able to pull together. You look fantastic!